The hardest part about talking about divorce rates is that most of the reports in the news are wrong…. (see comments here about this). After the eternal bliss, there are two ways out of marriage: divorce or death. I have posted my code and calculations for divorce rates using the 2010-2012 American Community Survey as an Open Science Framework project. The files there should be enough to get you started if you want to make multiple-decrement life tables for divorce or other things. 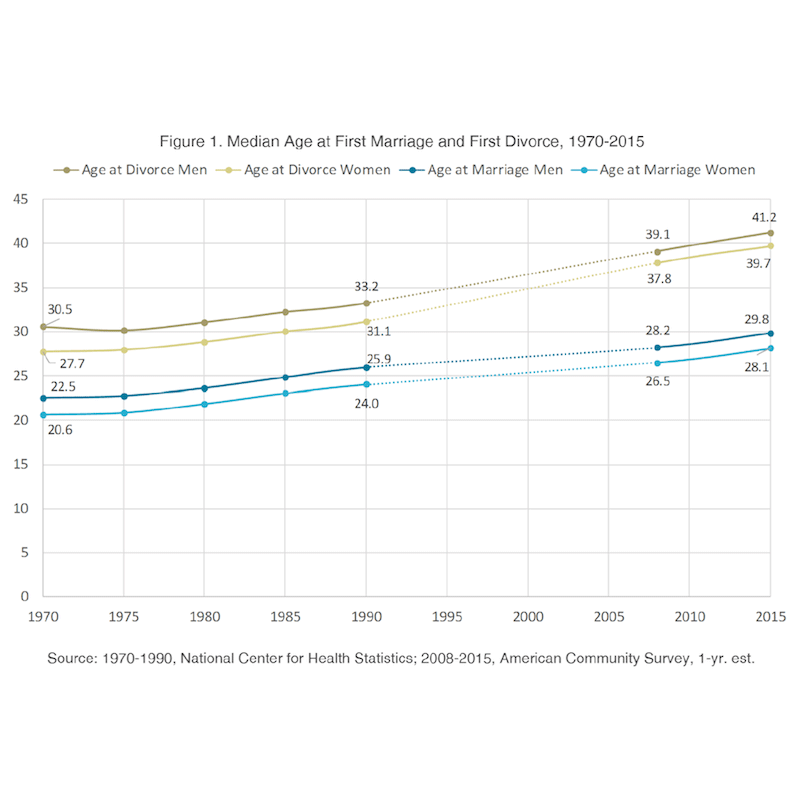 The age at which American men and women obtain their first divorce has been increasing since 1970 (because age at first marriage has also been increasing). In 2015 the average age at first divorce for men is 41.2 years of age and is 39.7 years of age for women. “To make families stronger, reduce family instability, enable young people to form marital or cohabiting unions, and eliminate child poverty, we must figure out how to share the bounty of the machines” (Ruggles, 2015). We are exploring how young people are using social media in dealing with their parents’ divorce. You can help if your parents divorced? Do you use social media? Are you between 18-25? Our survey will take about 10 minutes. Divorce rates from countries across the world are collected by the United Nations. Although we are in 2016, divorce rate information for 2013 is just being completed. I have posted an easily readable graph of 71 countries reporting here. You can find the original source of this data at the UN Demographic Report. They have a little data for 2014.